eNews-2016-Dec9 — MacKay & Company, Inc.
MacKay clients should use the PDF Form for a discount when registering. $ave $100 by registering before January 1, 2017. Our latest report was released THIS WEEK. 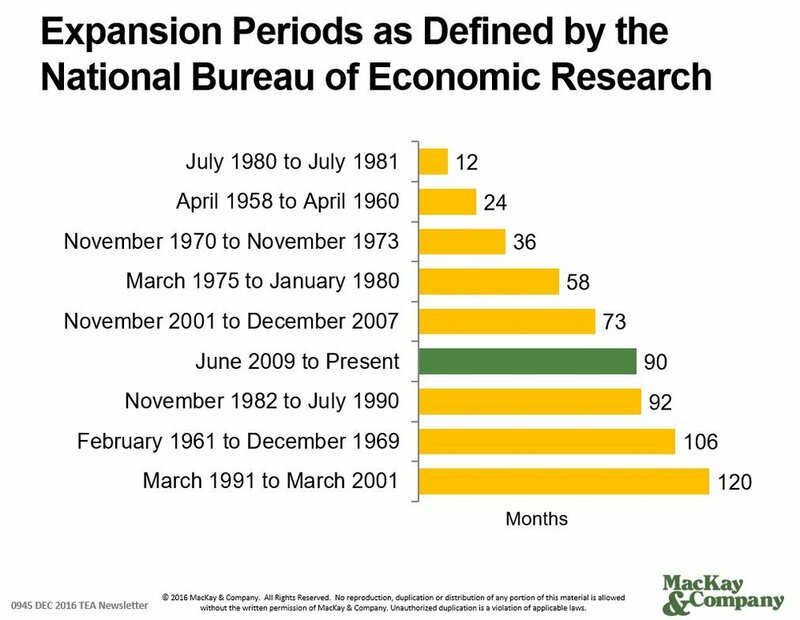 This expansion is poised to become the third longest on record, and will soon be in position to move into second place. We expect that fact not be lost on the new administration and strongly suspect that the actions they will be proposing will be designed to protect and promote the longevity of this phase of the business cycle. Paced by strong gains in Truckable Consumption (the largest component of TEA®) and Truckable Exports, Total Truckable Activity (TEA®) moved higher again in the third quarter of 2016. Truckable Consumption tends to follow a fairly steady sideways path during expansions, and it usually takes something significant to deflect the line to the downside. The most common such event is a deterioration in labor market conditions and that is certainly not happening now. The combination of rising consumer confidence and possible further improvement in labor market conditions suggests that the track we have been seeing here for the past several years should be maintained for the next several quarters. Enhanced Aggregate Spread [EAS], the leading indicator of business cycle turning points, we get from our associates at RDLB, Inc. The EAS looks ahead with a constant nine month forecast horizon. Its current forecast is that the expansion phase of the cycle should continue through the middle of 2017. This forecast is updated monthly, and if you would like more details, please drop us a line and we will put you in touch with RDLB. Contact John Blodgett to subscribe to TEA. Our survey is out in the field and by the end of FIRST QUARTER 2017, the results will be published and available to subscribers! The trend toward greater use of technology in trucks and trailers is clear and continues to increase. It is important to understand the impact of technology on the aftermarket and the opportunity that is represents. The upcoming 2017 research program will be the seventh time MacKay & Company has profiled the Mexican market. The objectives of this study are to provide participants with a comprehensive “DataMac® style” overview of the commercial vehicle parts and service market in Mexico. As with previous MacKay & Company studies in Mexico, the commercial vehicle market is defined as medium duty trucks (9 - 15 tons), heavy duty trucks (over 15 tons), buses (transit and motor coach) and trailers. DataMac® Mexico will be launched in the first quarter of 2017. MacKay & Company anticipates that it will be completed in the fourth quarter of 2017, but this will be dependent on participation levels. Email john.blodgett@mackayco.com for more info. Earlier this fall, DataMac Tire Operator Report was published. MacKay & Company has offered our DataMac® Tire service since 1995. DataMac® Tire tracks aftermarket demand for 16 tire segments. These include radial and bias tires for drive and steer axles on vehicle weight Classes 6, 7 and 8. Radial and bias replacement tires on trailers and container chassis account for the last two segments.